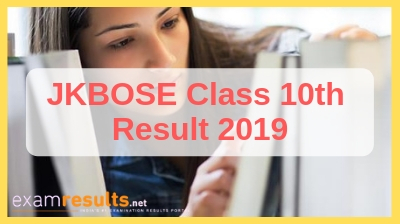 JKBOSE 10th Class result 2019, JKBOSE Class 10th Result Date 2019. April 03, 2019: The Jammu and Kashmir State Board of School Education (JKBOSE) usually announces the JKBOSE 10th Result 2019 as well as the JKBOSE 12th Class Results 2019 during the month of May. The JKBOSE officially conducts the JKBOSE Class 10 Exam during the months of February and March. You can check your JKBOSE 10th Result 2019 on this page. This year, the tentative date for the commencement JKBOSE Class 10 Exam 2019 is on the 25th of February, 2019 and the exams end on 19th of March, 2019, while the JKBOSE 10th Result 2019 is expected sometime in the month of May, 2019. The official Class 12 exam dates for the academic year 2018-2019 have also been announced by JKBOSE. The tentative date for the commencement of the exams is 23rd February, 2019 and it will last till 18th March, 2019. For regular updates about the JKBOSE 10th Result 2019, sample papers, Jammu Kashmir Board Class 10 Time Table keep visiting this website. Type the desired state name, examresults.net/jammu-kashmir/. Look for the link which says JKBOSE 10th Result. Click on the link and fill in all the details to get your JKBOSE 10th Result 2019. Take a print out of your JKBOSE Class 10 Result. The Jammu and Kashmir State Board of School Education (abbreviated as JKSBSE or JKSBOSE) is a board of school education in the state of Jammu & Kashmir, India. It is based in Jammu, and Srinagar and it’s a governmental body which is responsible for academic administration in the state of Jammu & Kashmir, India. It was founded on August 28, 1975. The board supervises, organises, controls, regulates and looks after the matters associated with school education in the state of Jammu & Kashmir. The primary function of the board is to specify courses of instruction and create syllabi for them, and to prepare academic programmes for elementary level, secondary level, and higher secondary level school examinations.